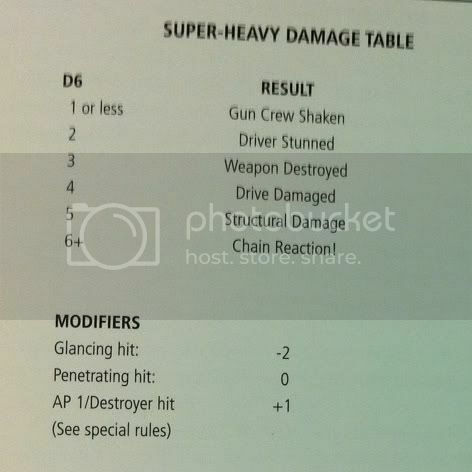 The damage table in 6th edition has also been changed. Last post we looked at a new type of damage for vehicles: hull points but this post is looking at something we should all be used to by now (assuming we've played the game before). In 5th edition gone are the different damage tables - there is one table to rule them all and depending what weapon and what type of damage you did to the vehicle would provide positive or negative modifiers to this table. For all intents and purposes this construct is the same - base table and modifiers however are different. One more Shaken result and no more Wrecked - that happens from Hull Point removal. For weapons without any modifiers, vehicles now essentially have a 2++ in terms of survivability based on the damage chart alone. Compare this to a 3++ from 5th edition. However, modifiers bring this 2++ right down on many occasions. AP1 is still the best thing out there for destroying vehicles with a +2 modifier this time around. That's essentially the exact same as in 5th edition but there's no Wrecked result and therefore a greater chance of getting Explosion results and causing further damage to Infantry. However, in the middle of the AP1 and everything else weapons are AP2 weapons - finally getting a nod at their increased ability to punch through tanks over their AP3 or worse brethren. They get a +1 modifier on the vehicle damage table which essentially brings them back to the 5th edition table - but again, no Wrecked results. This means if you want to destroy vehicles outside of Hull Point removal, you're really going to need to bring AP1 weapons. AP3 or worse is generally going to kill a vehicle through attrition & hull point removal before they actually explode a vehicle and AP2 weapons are on par with this method. AP1 weapons though have a fairly decent chance of simply bypassing the Hull Point system all together so if you're looking to drop vehicles, use AP1 weapons or torrent of fire. The other really big and important change to the vehicle damage chart is the removal of rolls on such a chart when Glancing Hits happen. In previous editions Glancing Hits had their own table which was much more forgiving for the vehicle (i.e. half Shaken results, only one destroyed result [if any], etc.). In 5th edition it was a simple -2 modifier which meant the vehicle could not be destroyed but still suppressed. In 6th edition all Glancing Hits do is remove Hull Points. This makes suppressing vehicles harder - you need to outright penetrate them or destroy them to generate some form of suppression on vehicles. This makes higher AV vehicles, particularly cheaper gun tanks, more attractive in 6th edition as they are less likely to be suppressed. Your average Autocannon can now not even suppress AV13 and a Missile Launcher has effectively had their chances to do so halved. Glancing Hits are still important though - see Hull Points. Just their ability to stop vehicles from shooting is now non-existent. This makes suppression resistant items less important as well such as Fortitude and Living Metal. They're still great for when those penetrating hits do happen - but all vehicles now come with some suppression resistance. Over-arching all of this is the new cover system. Cover is as a rule of thumb, weaker than in 5th edition. In 5th edition cover was a flat 4+ no matter what was giving you the cover. There were modifiers on this but in general if you had cover, you were stopping 50% of shots coming towards you. However, you had to get 50% of the individual facing cover and with vehicles, this wasn't always possible. Intelligent positioning of vehicles could generate this but there were ways around this (i.e. destroying the lead vehicle). There are two large changes to this system. First, cover is now 25% - much easier to get now even from infantry on vehicles. Secondly, cover as a general rule of thumb is 5+. Together this means you'll be getting cover...well nearly all the time now. It's pretty damn easy if the board is covered appropriately so make sure your vehicles have cover 99% of the time. However, it's not as effective before across the board but since its so easy to get, this is generally more than enough compensation. The biggest drawback here is self-generate cover (i.e. Jink, Smoke, KFF, etc.) isn't a 4+ anymore either and this makes leading vehicles more susceptible to death. Remember as well, with the Hull Point system, torrenting vehicles is the easiest way to remove them and a 4+ would be miles better here than a 5+. In conjunction with Hull Points vehicles are now very vulnerable to being torretened away but against single shots are much more survivable. This means as the game goes on, vehicles can become harder and harder to put down as the amount of firepower available to each army becomes less. You're then looking to break vehicles based on the damage chart and unless you're AP2 or AP1, that's only going to happen one every six penetrating hits. This means higher AVs, particularly at range where melta weapons are less likely to get to them and combined with their new suppression resistance, have gotten a little boost. These are the vehicles you're more likely to see alive at the end of the game whilst transports and midfield based vehicles are far more likely to meet a fiery end as their hull points run out.